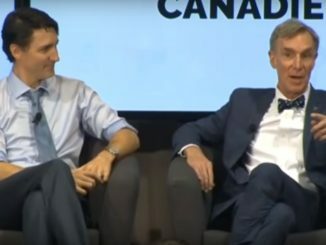 HomeCanadian PoliticsSo who did pay for Bill Nye to campaign for Trudeau? 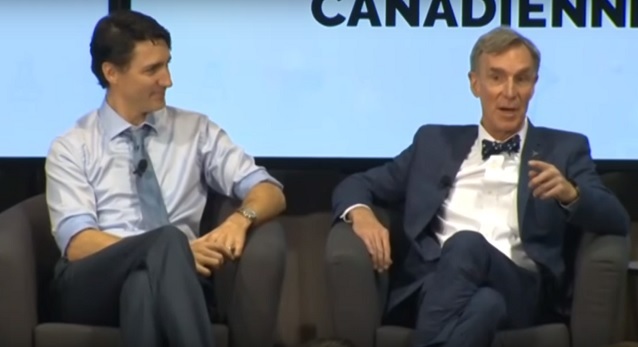 Yesterday I posted on Bill Nye, the so-called science guy…..or would that now be “science person” in Justin Trudeau’s world? Anyway, my post asked who paid for Nye to come to Ottawa and hold what was billed as an “armchair discussion” between Nye and Trudeau. The reported purpose was to discuss the investment in science in the 2018 budget. Is it just me or is it weird that the government would invite a man who is not a scientist, Nye is a mechanical engineer who hosted a science oriented show aimed at young kids, to discuss the importance of science in the federal budget? Let’s be frank, this was not a non-partisan event, this was an event to generate buzz on a Liberal friendly university campus and boost the prime minister by using an American TV celebrity. So my question yesterday was who paid? Nye’s speaking fee ranges from $50-75,000 USD or $64,497 to $96,746 in Canadian dollars. That is steep and I can tell you that often the people that charge big speaking fees also charge travel and expenses on top of their big fee. I wanted to know if this was an event that the PMO paid for or if it was the University of Ottawa. The PMO assured me that they did not pay for any of Bill Nye’s speaking fees or expenses. When I asked the University of Ottawa, they told me that they were simply the host and told me to check with back with the PMO and a woman named Eleanore Catenaro. Ms. Catenaro assured me that not only did the PMO not pay for anything but neither did any other government department or agency. “The government did not cover any of his expenses, and there was no speaking or appearance fee‎,” Catenaro said. Either a third party picked up Nye’s fee or he waived it. Both of which are problematic. As I said earlier, this was essentially a partisan event, a pep rally for the PM and his budget. He knew that bringing a former TV star to a university campus full of students that had watched Nye growing up would help him politically. He knew that he would get a media boost. So did a donor or Liberal friendly group pick up Nye’s fee and expenses? If so will that be counted as a donation to the Liberal Party of Canada? Did Nye waive his fee to help a prime minister that he likes? If so will that be counted as a foreign donation to the Liberal Party? Foreign donations are illegal. 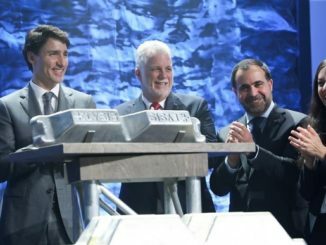 With Nye campaigning with Trudeau and Al Gore campaigning with Kathleen Wynne in Ontario, it is beyond time that more in the media started asking questions about these sorts of events. Who paid for this? Probably someone who has made a bundle off of the AGW fraud. Whoever paid got taken to the cleaners. The credit card name could be Steyer or Soros or Tides or Hewlett or Packard foundations. Probably not directly a Canadian donor except the ones fed by the aforementioned and their ilk. Smells like Steyers or Soros, or Tides Foundation, or Hewlett or Packard foundations, etc.indirectly, but through their donations to Canadian pinko-greenies. So this is just a twist on the supposed “Russian” aspect of the election in the U.S. … only when it’s libs doing it then it seems to be OK. I suggest that someone look at a Soros or Tides Foundation or Buffet involvement … but yes, something stinks! Brian, we in “Canada” have one of the most disinterested official media in the world. I won’t call journalism a profession in the same manner as lawyer, engineer or doctor for the aforementioned all have regulatory bodies to adjudicate the conduct of their members. Journalism has none of that. There’s no accountability and no pressure to be correct or accurate. Will “Canada’s” media ever be curious about Trudeau in the way they would be forensic over Harper? Hardly har-har! Mr Dressup may have been extended a professional courtesy by Mr Nye. It may have been the Trudeau Foundation that helped paid for Nye. In 2015 the foundation paid for Hillary Clinton to speak at the Canada 2020 conference. Reminder…The federal government under Chretien, gave the Trudeau Foundation a $120 million. Hopefully our university young woman and men are not that gullible. I hope they think fir themselves and see what this idiot is doing to Canada! Good Question! 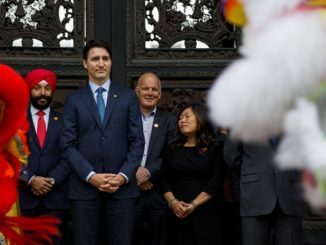 Also, how much did the taxpayers pay for the Trudeau and entourage holiday in India, and why aren’t there strict guidelines on these so-called “trade missions”? Well, this is splitting hairs, but “technically”, Bill Nye is a “scientist” – he has a B.Sc in Mechanical Engineering. On the other hand, David Suzuki is NOT a scientist, as his Degrees are Arts degrees: B.A. Biology, Ph.D. Zoology …… ARTS DEGREES, not SCIENCE DEGREES!!! !